Boris Minaev, the biographer of Russia’s first president, writes about the concept behind the first museum of its kind in the country, which will open in the summer of 2014. At No. 3, Yeltsin Street, in the heart of Yekaterinburg, a major city in the Ural Mountains, construction has been underway for about a year. Locals are well aware well that inside the fence on the site of a former shopping centre, the Presidential Centre of Boris Yeltsin, their native son, is being built. Many have already taken part in creating the exhibits by donating “artefacts of modern history” for the future museum. For example, food vouchers from the era of queues and shortages -- people needed these gray pieces of paper in the 1980s to buy the most basic groceries like grains, sugar, and butter. People have donated old photos, newspapers and magazines, leaflets and posters that date from 1991 to 1996 when the first president of Russia visited his home town to garner support during his electoral campaign. Most people know that a museum is being built, but not all are aware that this is “a centre of the historical heritage of the President of Russia who gave up his authority.” So reads Federal Act No. 68 dated May 13, 2008 that was adopted by the State Duma. Every former president will now have his own presidential library or “presidential centre” where anyone who so desires will be able to see what the politician did, what laws he signed, with whom he met, and what era he lived in. The idea is that former presidents will hand over their archives, gifts, manuscripts, and valuable documents to these centres. These centres will be a place for historical and scientific research and humanitarian projects. But most importantly, these centres will be open for visitors. Someday there will be several of these museums. And by the end of the century there will be nearly 20! Boris Yeltsin was the first president to be democratically elected by universal direct vote. Prior to his election Russia had never elected a head of state. The 1990's were the Yeltsin era - a time of upheaval and changes in lifestyle, when the country overcame political and economic crises in the painful move forward from the Soviet past to democracy and a market economy. Assessments of the era are still very mixed. Ralph Appelbaum Associates (New York), responsible for creating presidential libraries in the US, in particular, the Clinton library, and the Jewish museum in Moscow, won an open competition to take part in creating the exhibits. Working alongside them is a team of architects, archivists, engineers, and Russian screenwriters. The group is headed by the famous film producer Paul Lungin. The task of the creative group is to create an exhibit dedicated to Russia's twentieth century, beginning with the First World War and ending with its last days. The Labyrinth of Russian History hall goes from terrible documents of the Great Terror of the 1930's, to military movies and photos, up to signs that people carried during the enormous demonstrations of the '80s when they demanded an end to the Communist monopoly on power. The exhibit on “Seven Days” of the Boris Yeltsin era goes from his first scandalous speech in the Kremlin at a session commemorating the 70th anniversary of the Soviet Union up to his voluntary resignation on December 31, 1999. 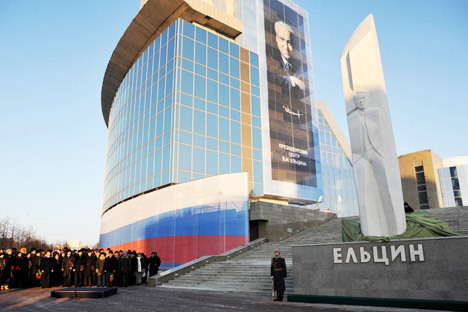 The creative group promises that the Presidential Centre will hold not only a museum of modern history, exhibits devoted to Boris Yeltsin himself and his era, and temporary exhibitions. There will also be a children's centre for creativity and social initiatives, concerts and public lectures, and debates and conferences on the challenges of modern Russia. The goals of the presidential centre are rather complex: to fit within the context of the current needs of a large city and, at the same time, within the context of its era. But most importantly, perhaps, is that the Yeltsin Centre is designed first of all with the young generation in mind, those who were born in the 1990's. They know very little about this era, sometimes almost nothing. They confuse the dates and names and are content with the myths and stereotypes that adults have told them. There is often no one to tell them what actually happened and why. This is the problem, and the mission of the Boris Yeltsin Presidential Centre is to tackle this problem along with others.